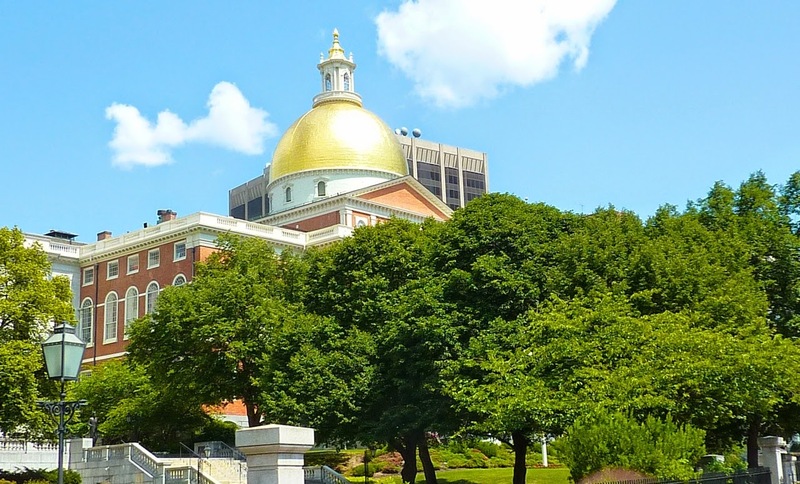 From time to time we'll post interesting day trips, historical in nature, from around New England. Got any ideas? Submit them. For 20 years we've wanted to do this and finally got around to it. It was a beautiful, August summer morning so we purchased tickets on line for the noon tour and set out to see sights that we were very familiar with, but from a slightly different angle. From the Prudential Center on Huntington Avenue. 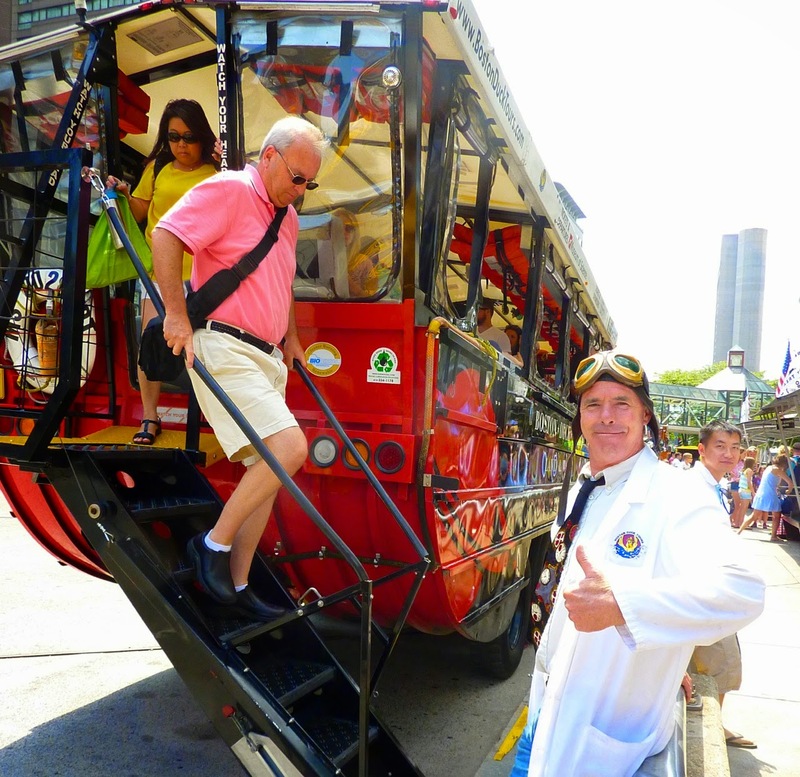 This is a DUKW which is an acronym for "1942 designed, utility, all wheel drive, dual rear axles." In English, it's a 1942, GMC, amphibious vehicle designed for the military during WWII by a reserve Naval officer at MIT. Soldiers simply called it a DUCK! 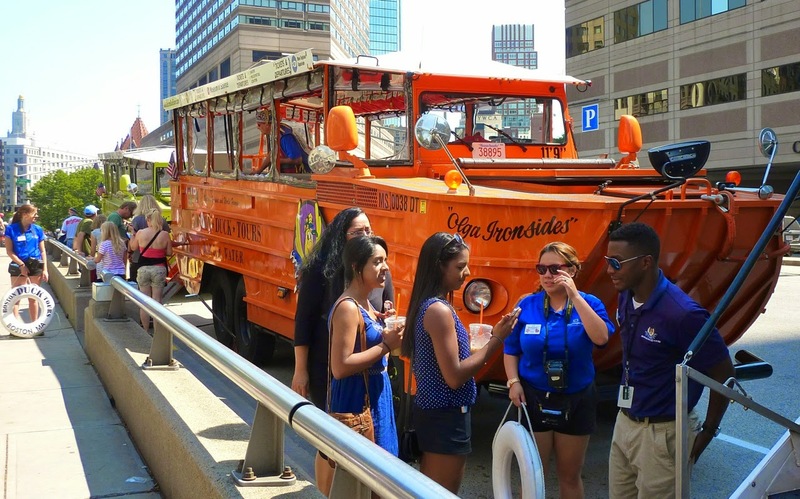 21,000 were manufactured by General Motors and Boston Duck Tours operates a fleet of 28 from three Boston locations; the Prudential Center, Museum of Science and the NE Aquarium almost continuously throughout the day from March 18 through November 30. They seat approximately 30 passengers in small seats; it's a little crowded and the last row back will afford the most space after the ramp is retracted. Tickets are in the $35 range, ours cost $30 with a "senior" (I hate that term) discount. 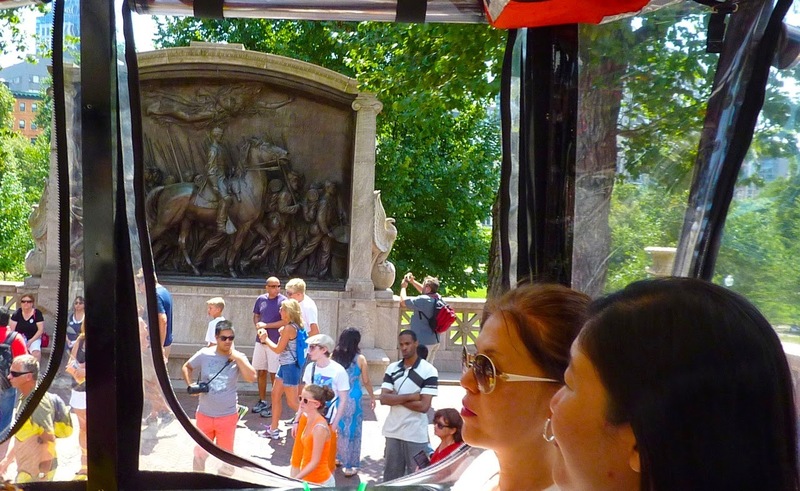 The tour lasts about 80 minutes, visits the usual sites along the Freedom Trail and is delivered by very "enthusiastic" tour guides. We had Professor Quackenstein and he was worth the price of admission. Augustus Saint Gaudens memorial to Colonel Robert Gould Shaw and the Massachusetts 54th, across the street from the State House on Boston Common. 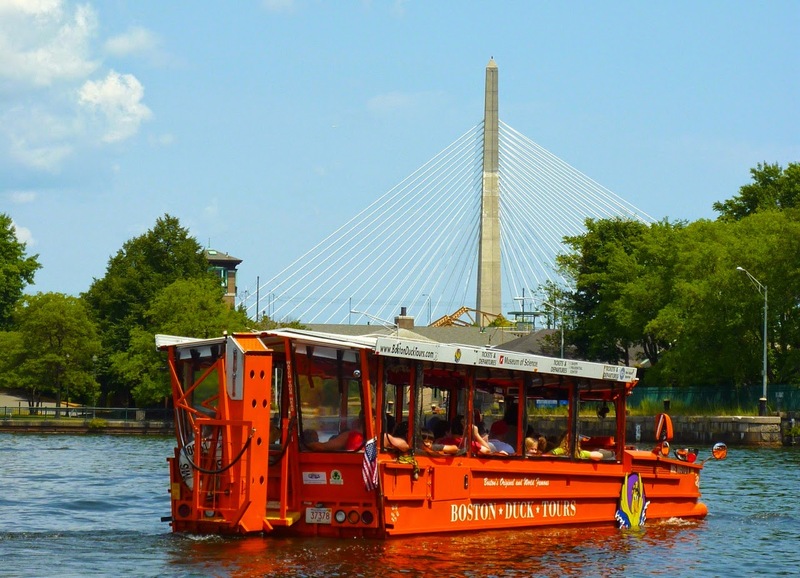 The highlight of the tour and what separates it from other tours is that your DUKW, near the Museum of Science, drops into the Charles River. If you have kids, the tour guides will have them come up and steer the boat. It gave a nice view of the Boston Skyline and of MIT on McGrath and O'Brian Highway in Cambridge. USS Constitution, or Old Ironsides, the nations oldest commissioned warship as we pass by the Charlestown Naval Shipyard. 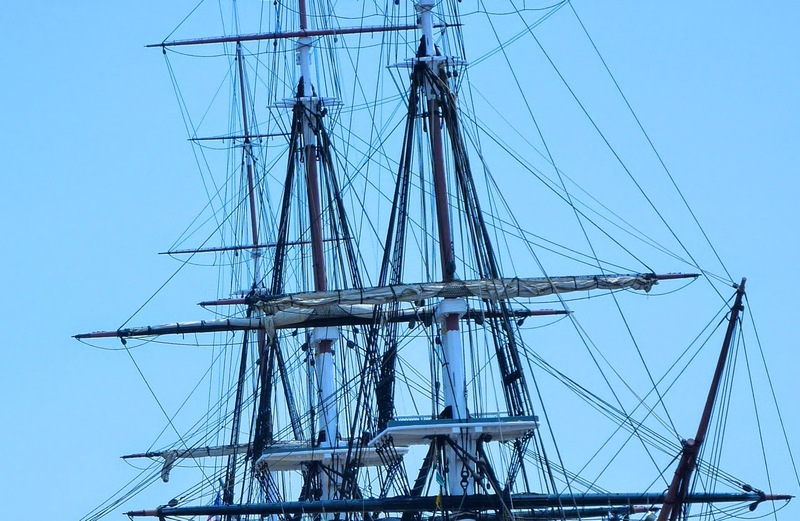 Launched in 1797 and commissioned by George Washington as one of six frigates to be constructed, her sister ship USS Constellation is on display in Baltimore Harbor. Built by Boston Merchant Peter Faneuil in 1742, he gifted Faneuil Hall to the City to promote trade. In the background is the Customs House Tower, completed in 1847 and was Boston's tallest building into the early 1950's. 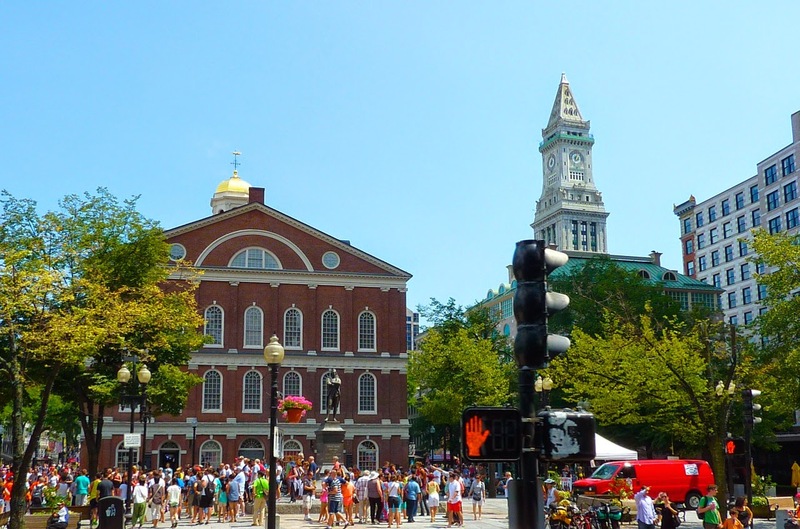 There's much to see and do here at the Faneuil Hall Marketplace including America's oldest restaurant, The Union Oyster House. The Green Dragon Tavern where the Son's of Liberty congregated and Durgin Park. 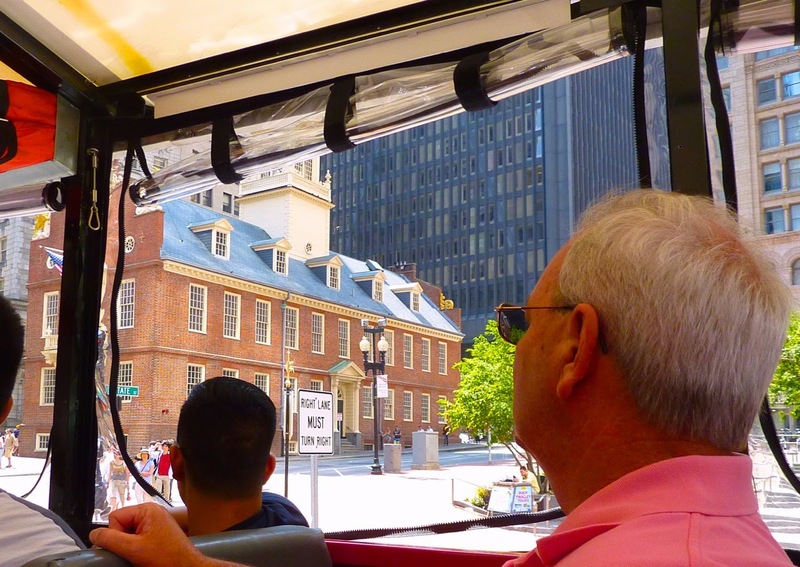 A view from our Duck approaching Boston's oldest building, the Old State House built in 1713. The Declaration of Independence was first read to the citizens from a balcony on this building on July 18, 1776. 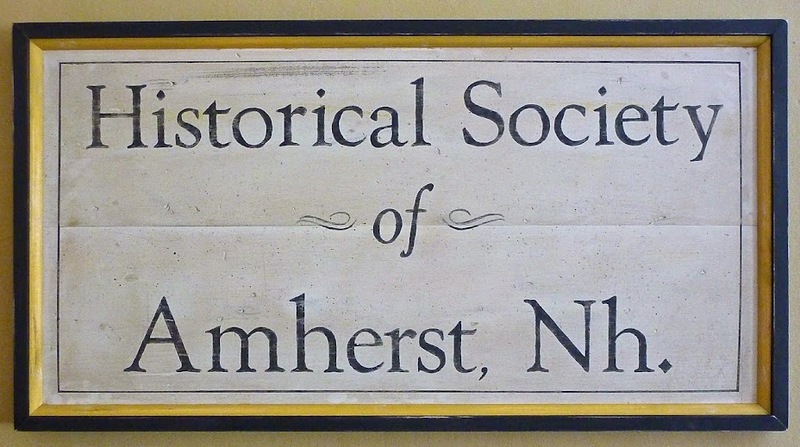 The same day coincidentally that Sheriff Moses Kelly read the Declaration to Amherst citizens on our town common. The Boston Massacre took place at the east end of this building that you can see here on March 5, 1770. 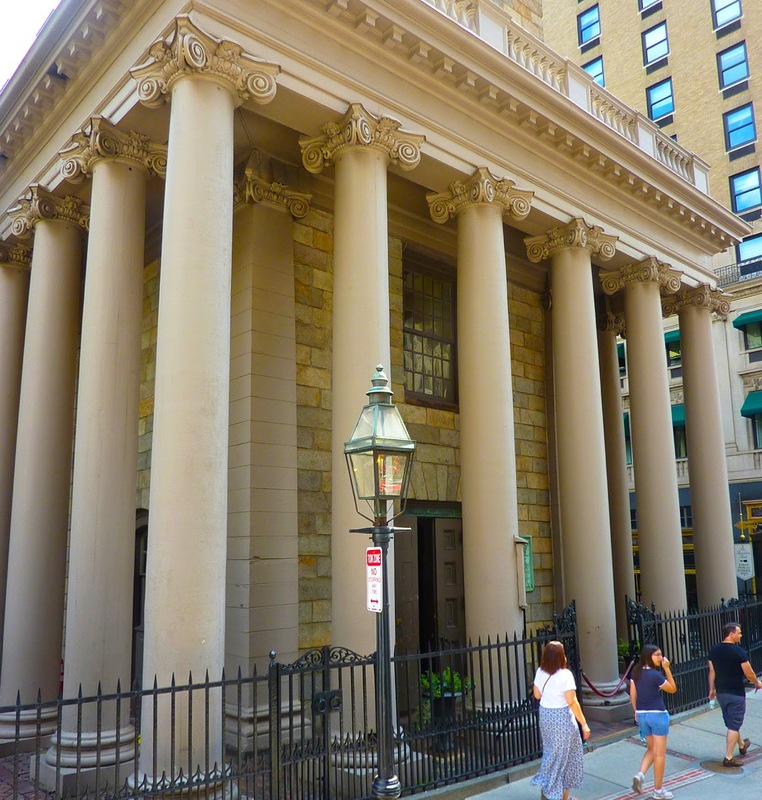 Nearly razed in 1881 its protected today by the Bostonian Society which operates the museum within. Kings Chapel, dedicated in 1689 at the corner of Tremont and School Streets. The Kings Chapel Burial Ground, just to the left, was created in 1630, the year Boston was founded and is the city's oldest cemetery. 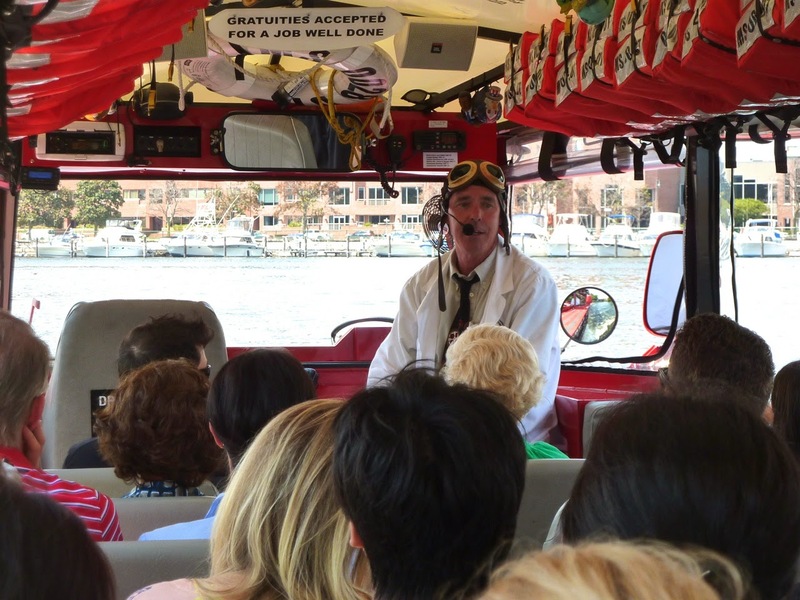 Professor Quackenstein speaking with his audience as we explore the Charles River. Looking past the Longfellow Bridge (1906) from right to left, towards the Prudential Center (1964) The John Hancock Tower (1976) and the old John Hancock building (1947) as we motor down the Charles River in our WWII, amphibious troop carrier. 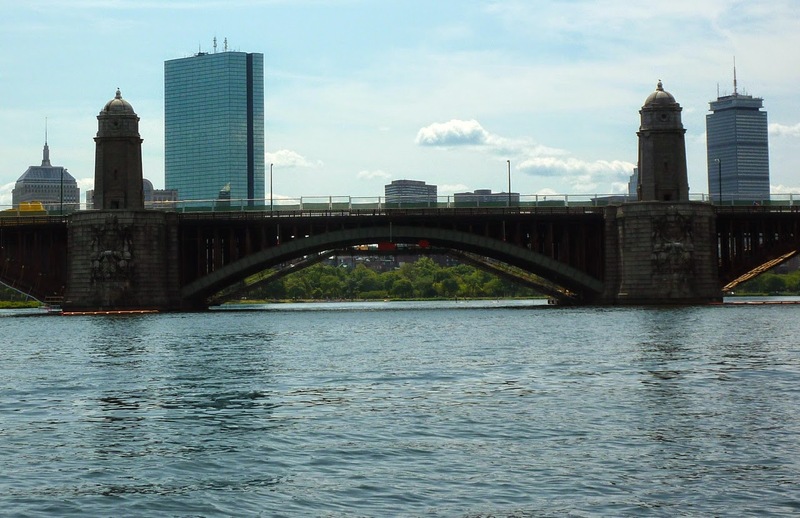 The two identical buildings at the end of the span, are part of the bridge and due to their appearance, citizens nicknamed this the "the salt and pepper shaker bridge." Do you see the tower with an antenna on top of the Old John Hancock Building to the far left? This is a tall, vertical light that flashes a code for the weather forecast. There's a famous poem concerning this light: "STEADY BLUE, CLEAR VIEW. FLASHING BLUE, CLOUDS ARE DUE. STEADY RED, RAIN AHEAD. FLASHING RED SNOW INSTEAD... except in the summer when it means the Red Sox have cancelled due to weather. 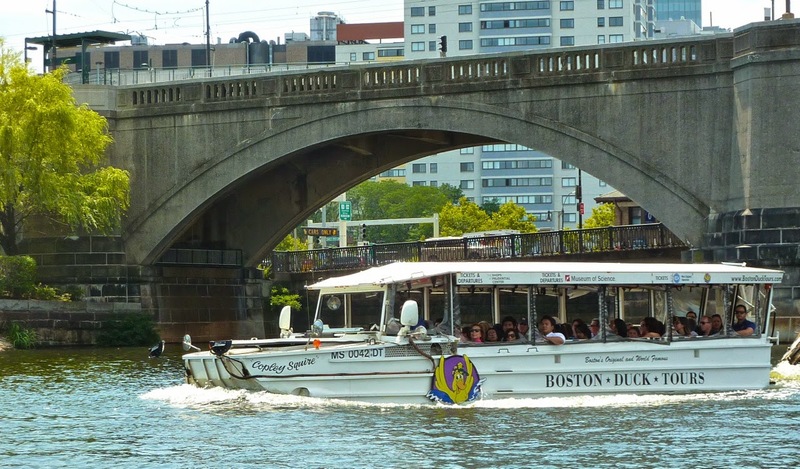 A fellow DUKW in the Charles, waiting for the channel to open to leave the river. That's the Leonard P. Zakim, Bunker Hill Memorial Bridge in the background. 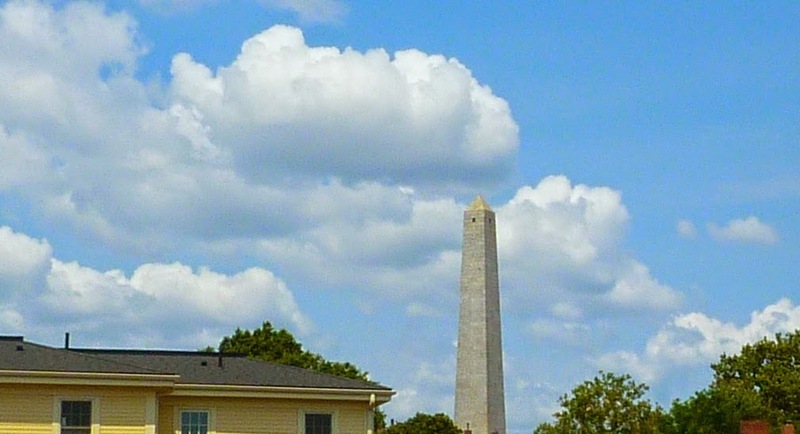 The 221' Bunker Hill Monument was completed in 1843 to commemorate the battle fought on June 17, 1775. The Americans withdrew after exhausting their ordinance and engaging in hand to hand combat with the Brits, who suffered 1154 casualties compared to 417 for the Americans. A British General was heard to say, "we win too many more engagements like this and we'll loose the war." The bronze statue of General Washington, dedicated in 1869, at the Arlington Street entrance to the Boston Public Garden established in 1837. 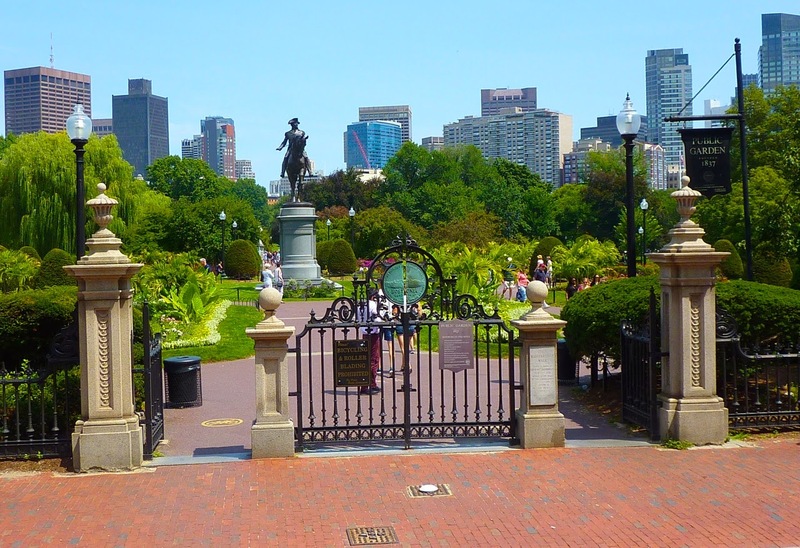 This is part of Boston Common, the oldest city park in the United States. 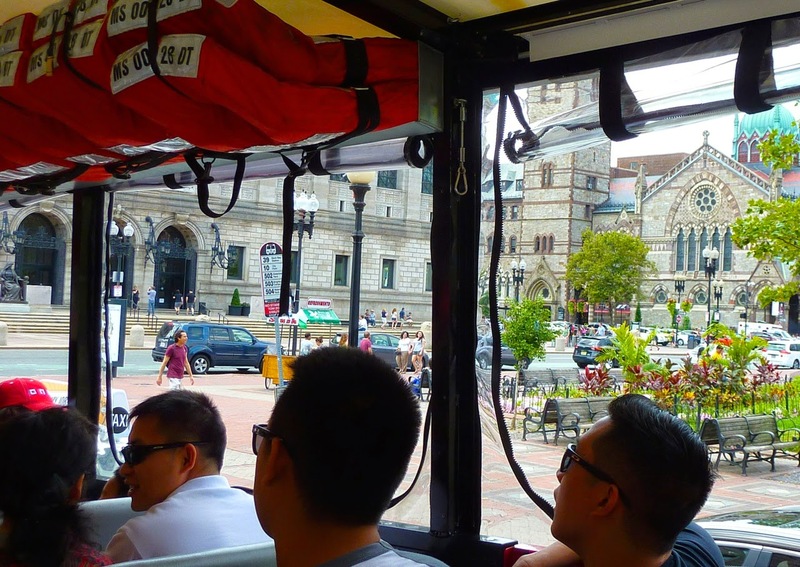 The Boston Public Library and Old South Church from within our DUKW. Founded in 1848 the BPL is the second largest public library in the US behind the library of congress.